Blend all ingredients and heat for 3 min. 30 sec. in the microwave. Blend again, spread on Silpat using the stencil with the desired shape. Bake for 11 min. at 160°C. Roll and keep in hermetic box. Mix together all ingredients. Crumble cold, bake for 16 mins. 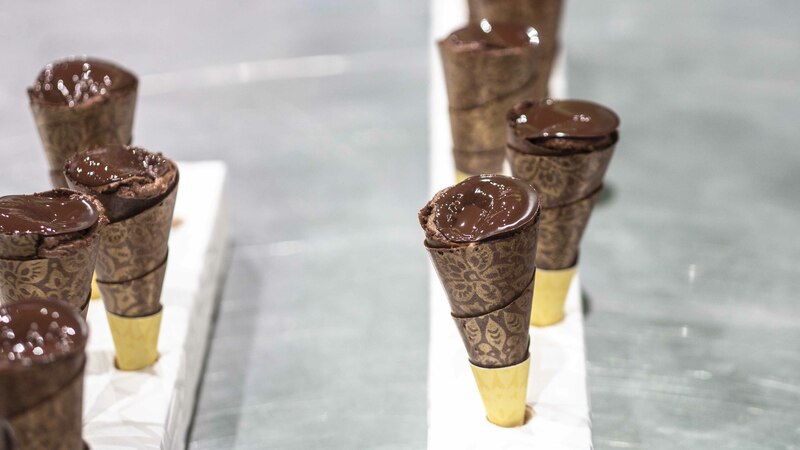 at 150°C, isolate the cones using a brush with the cocoa butter, add the crumble inside, a regular layer. Heat whole milk and pour over Cacao Barry chocolates. Add yolk and whip together egg white and crystal sugar. Incorporate the meringue into the mix at 40°C. Pipe into the cones, insert the crémeux inserts. Cover with the mi-cuit, bake for 5 min at 220°C, leave for 4 mins. and serve in their natural packaging.